What has a splinter in your finger or a wound on the foot to do with the risk of developing Alzheimer's disease, a heart attack or contracting cancer of the colon? More than most people think! As we learn more and more about the causes of these and many other serious diseases, it becomes increasingly clear, that there is a link to our old defense mechanism; inflammation - the same biological process that causes tissue around a splinter to turn red and an injured foot to swell. The evidence is piling up and begins to radically change the perception of why we get chronic diseases. With tissue damage, whether it is large or small, there will always be inflammation. It is a necessary part of the body's self-repair. The damaged cells release substances that activate a cascade of events and present the classic signs of inflammation: heat, redness, swelling, pain and possibly loss of function. Local immune cells are activated and summon more, the capillaries become more permeable and fluid is leaking into the tissues. Damaged tissue is dissolved and removed by macrophages and reconstruction begins. The substances responsible for the degradation of the destroyed cells are the so-called free radicals, which are positively charged ions with a high ability to break chemical bonds. When the process is complete, the production of free radicals stops and a possible excess is neutralized by the body's natural antioxidants. 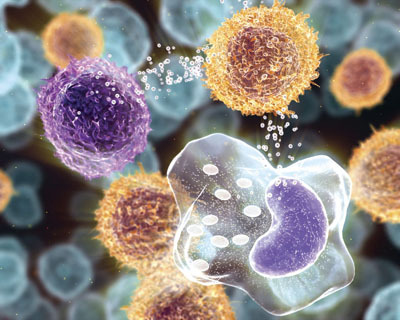 Inflammation has become one of the hottest topics in medical research, driven by the attractive idea that one may develop new drugs to fight inflammation in general. That would be much simpler than inventing specialized medicine against various chronic diseases, which so far has not been particularly successful. But as holistic practitioners our focus should be fundamentally different. It's not about "fighting" inflammation, it's about trying to understand why the inflammation is out of control and help the immune system to find a better balance. Are we living too sterile? Why is inflammation, which is one of our best friends, sometimes our worst enemy? Is it possible that our bodies seen in an evolutionary perspective, become victims of their own success? Our species evolved in part because of its ability to fight invading microorganisms. Do we now live in such a relatively sterile environment compared to earlier times, that the immune system is in fact oversized and has so little to do that it it sometimes react against ourselves? It seems that many of the typical ingredients of the Western lifestyle - high consumption of sugar and saturated fat, limited exercise - are enhancing inflammatory processes. What we eat is perhaps the most important regulator of inflammation. It is well known that fewer carbohydrates, less dairy products and more fish is a good idea, but here we will also mention three factors which are perhaps less known. Variety is a key word. Most of our food is made up of a few items, and it turns out that the immune system can be triggered if it is constantly exposed to the same foods. The interesting thing is that this also applies even with super healthy foods. Especially the breakfast and to some extent lunch is for many people the same every day. It is a good idea to have at least three different variations through the week. Gluten is another factor, which in many people works proinflammatory. One approach could be to take a month free of gluten followed by eating less bread and only every other day so your system gets days without gluten. This rule of days completely free of the most common food items often works wonders. Fat is a very important factor for the regulation of inflammation. 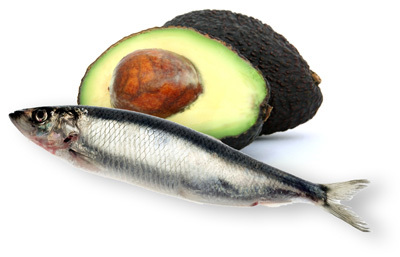 Increase omega 3 intake with fish, nuts, avocado, etc. and add a few tablespoons of flaxseed oil a day. That psychology affects our healing is not unknown. There is mounting evidence to suggest that emotional themes such as anger and loneliness (perhaps founded in childhood), shock, sadness and traumatic life events can be a contributing factor in the inflammatory body? The way we think as a much greater physical impact than most people are aware. The research field of psychoneuroimmunology is relatively young but very exciting to follow. New research shows that an effective way to regulate inflammation processes is such a simple thing as grounding. When the body has electrical contact with the earth, it takes up free electrons from the ground, which act as antioxidants and neutralize free radicals. The mammalian immune system was developed at a time when animals - and later people - walked barefoot and slept in direct contact with the ground. So maybe our physiology is constructed to utilize free electrons from the ground to keep the inflammation processes under control. Today, most people are effectively insulated from the earth with rubber soles, hardwood floors, carpets, etc. The climate and other practical circumstances may be an obstacle, so alternatively it is possible to purchase bed sheets with silver threads woven into the fabric, or conducting mats to put on or below a desk, and connect those to the in-house ground wire of the electrical system or to a separate ground rod. Some professional cyclists are sleeping in grounded ”recovery bags” to speed up healing of injuries and overused muscles. Fig. 3 Earthing: Let the feet graze! Reflexology is an obvious way to help the body balance the immune response. You can use many approaches and involve many different reflex areas. The adrenal glands are key players in the regulation of inflammation. The following is an effective technique for working these reflexes to help balance inflammation. Reflex linking means working two different reflex zones simultaneously. 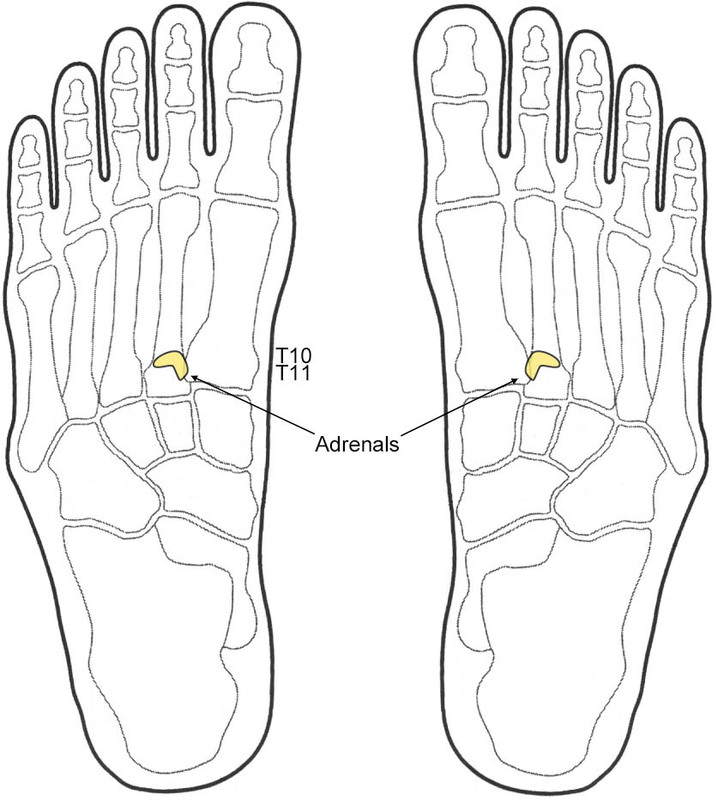 Here we link the adrenal gland reflex with a symptomatic reflex area of inflammation (i.e. frozen shoulder, colitis, brochitis, etc). This method is an energy technique, in which the two reflexes are worked - or simply held - with a very light touch. The best results are obtained by being fully alert and focused on the energy exchange. Try to visualize how inflammation reducing hormones flow from the adrenals to the problem area. Work with one adrenal gland reflex at the time. The linked reflexes can be on the same or on opposite feet. Duration: As long as both therapist and client can maintain focus and sense ”some kind of connection”. Learn more about inflammation and many more specific reflexology techniques in the Touchpoint workshop “Round about: The Immune System”.